Assalam o Alaikum, I hope all of them are good. 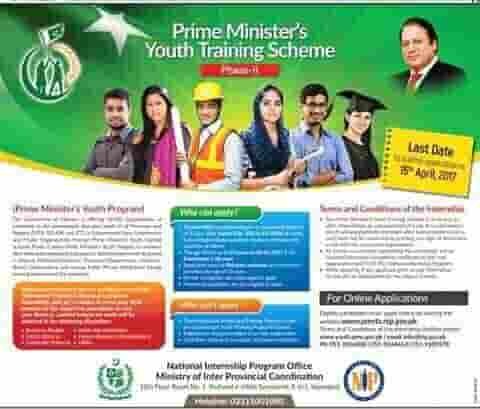 Pmyts ( Prime Minister Youth Training Scheme ) has to be announced his new phase of the internship program for a new degree or Diploma holder's Candidates. Which are pass their education and get the result for a job application. http://pmyts.nip.gov.pk. for Prime Minister's Youth Training Shame 2017, Phase TWO. 3-year madrassah graduates are entitled to apply. Three Year of Diploma after Matric / FSc. The minimum requirement for selection of internship is 50% of marks or 2.5 CGPA in final degree/diploma. Male and female candidates will be applied for an internship. If someone has above criteria then you can apply for Posts Internship. If degree or diploma does not approve by HEC recognized then your application will be rejected from PM youth training. 1st of all you must have a fast speed internet connection. Open you are any web browser and in search bar type PMYTS or directly type in URL this link http://pmyts.nip.gov.pk or just click on this link, it will be open in a new page of your browser. When above link opens completely you can see different criteria of application for Internship. Here are three different criteria box for your application. Option or preference for placement. Please read carefully before applying, any incorrect data is the major cause for rejection of the application. The first step is personal data, everybody knows about own personal data so in this section provide your personal data Like. And last one Passport size color photo. The second steps are academic details. If you are eligible for internship and your qualification meet to requirement then please provide original details about your degree/diploma. The last in this section is Disabilities if anyone has otherwise unchecked the box. Select Three areas for training which are related to your qualification. Now just Click the Submit Button and get your tracking Id. Also sent to you on your Email. And wait for next procedure by PMYTS. and leave comment us on Comment box for any quarry or suggestion.